HOW TO LIGHT CHARCOAL FAST - WITHOUT A CORD! There has never been a faster, easier, and cord free way to light your grill than with the Grill Torch Charcoal Starter. 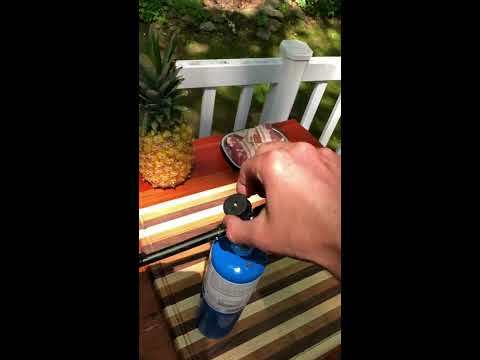 The Grill Torch unique design allows you to quickly light your grill from 20" away, while keeping the propane canister safely upright. The Grill Torch Charcoal Lighter does not require you to blow air on your charcoal to start it, which greatly reduces sparking. The self ignition makes lighting a breeze and the flame is fully adjustable up to 1300 degrees C. Simply screw the Grill Torch head into a standard 14oz. propane or MAP gas canister and you are ready to go (Propane canister not included, you can pick them up at Walmart or any hardware store for around $3). Not only is the Grill Torch a great grill lighter, but it is also the perfect fire pit lighter. Additionally, the portability of the Grill Torch makes it a great weed killer, ice melter, driveway crack sealer, and has many more uses.